about the media DVD with film-essay, showing two old people eating together in determined silence. Duration: 11 minutes. 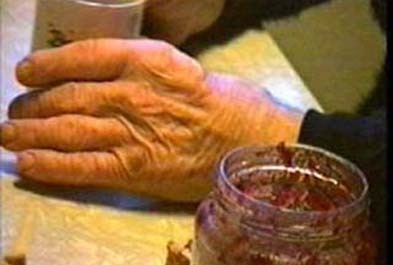 about the project The video “Harvest” shows two old people eating together in determined silence. Stenseth filmed in an ‘amateur’ style: we see mixed lighting, slow motion and a grainy texture. The last adds a level of sensitivity to the video essay. The sound image consists of a compilation of twelfth-century music that is not immediately recognisable, though the atmosphere it creates hangs intuitively together with the visual imagery. 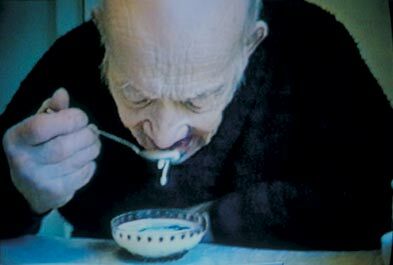 The way Stenseth films the couple eating a daily meal in their daily surroundings, makes us see a common situation anew. Moreover, the filmed couple gives us a different perspective on age. It is common knowledge that growing older doesn’t mean life is getting easier – we encounter pain or loss of dignity. Stenseth shows a beautiful and moving aspect of old age: unadulterated joy, tranquillity, tacit contentment and rewarding companionship. about artist and participants For Stenseth this first video essay is a very personal document: the couple in the film are her grandparents. They are farmers in a small village on the west coast of Norway. The earliest and best-known works by Anne Lise Stenseth (1959) show dolls that have been given facial features similar to kids with Down’s syndrome. These works indicate one of the central aspects of Anne Lise Stenseth’s art projects, namely the exploration of the borderlines of normalcy. In her newer photographic work one can easily discover the art-historical precedent, but as always there is another fascinating aspect. Her works emanate a strong sense of taking pleasure in seeing and discovering, which rubs off on the spectator.